U.S. President Donald Trump and first lady Melania Trump have travelled to Florida's storm-ravaged Panhandle and to Georgia to see the destruction caused by deadly Hurricane Michael. U.S. President Donald Trump got a first-hand look at the "total devastation" that Hurricane Michael brought to Florida's Panhandle, meeting with survivors Monday and saying that providing food and safety for them was a top priority. 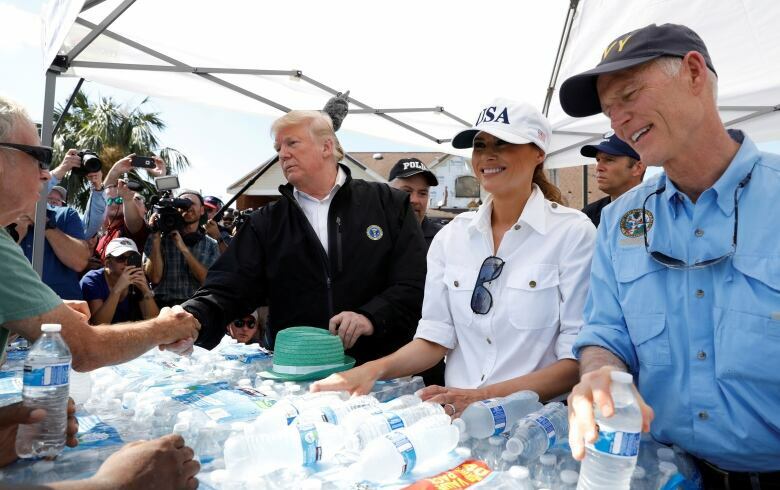 Trump and first lady Melania Trump passed out bottles of water at an aid centre in Lynn Haven, a city of about 18,500 people near Panama City in northwestern Florida, after taking a helicopter flight from Eglin Air Force Base about 160 kilometres to the west. "To see this personally is very tough — total devastation," said Trump, who later travelled to neighbouring Georgia to see storm damage there. At least 18 deaths in four states have been blamed on Michael, which crashed into the Panhandle last Wednesday as one of the most powerful storms on record to hit the continental United States. In Lynn Haven, Trump chatted with residents and praised the crews that had cleared roads on his route. Trump, who travelled to North and South Carolina after they were hit by Hurricane Florence last month, said previous storm sites he had visited seemed to have been hit hardest by water but that Florida's damage was more wind-related. "Look behind you at these massive trees ripped out of the earth," Trump said to reporters, likening the storm to an "extremely wide tornado." Upon his arrival at Eglin from Washington, Trump said the day's biggest objective was "just making sure everyone is safe, that they're fed." "You know many of these people, they have no homes," he said. "Some of them have no trace of a home ... so our big thing is feeding, water and safety." Trump was accompanied by Florida Governor Rick Scott, a fellow Republican who is running for a seat in the U.S. Senate against an incumbent Democrat in the Nov. 6 congressional elections in which their party is fighting to retain control of Congress. Before the helicopter flight, Trump and Scott praised each other. After visiting Florida for a few hours, the Trumps flew to Robins Air Force Base in Georgia to look at a part of that state that was hit by Michael and get a briefing from state and local officials. They planned to return to Washington on Monday evening, the White House said. 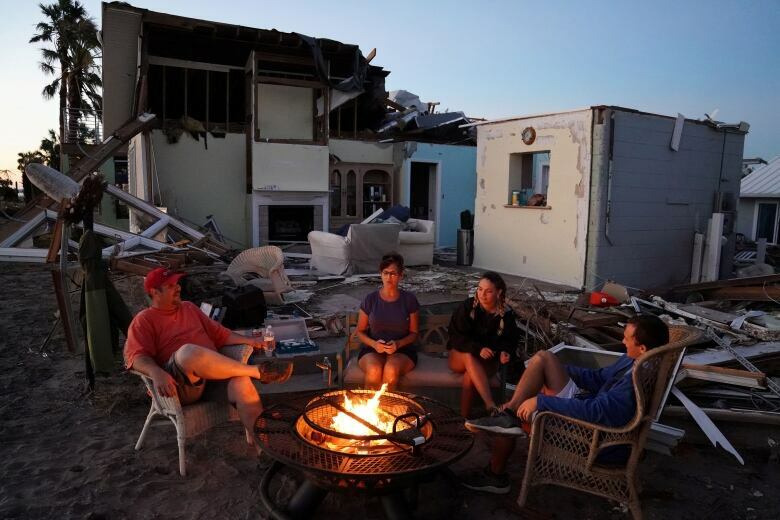 Insured losses for wind and storm surge from Hurricane Michael will run between an estimated $6 billion US and $10 billion US, risk modeller AIR Worldwide said. Those figures do not include losses paid out by the National Flood Insurance Program or uninsured property, the company said. Michael hit the Florida Panhandle with 250 km/h winds as a Category 4 hurricane on the five-step Saffir-Simpson scale. "If we lose only one life, to me that's going to be a miracle," Mexico Beach Mayor Al Cathey told Florida media. Water service was restored to some in Panama City on Monday but Bay County officials said the water was not yet safe to drink. Home owners were advised to keep toilet flushes to a minimum because the sewer system was operating at half capacity. The Florida Division of Emergency Management said that while power was returning in most areas, at least 85 per cent of customers in four mainly rural Panhandle counties were without electricity on Monday. Officials said it could be weeks before power returns to the most damaged areas. In Panama City, Fire Chief Alex Baird said search-and-rescue teams were now in "recovery mode" after largely giving up hope of finding more survivors.